Before your vacations in Vietnam, Vietnamstay would like to provide you some brief information about this country. Myanmar, the famous land for sacred mystery is not only a place for tourists to enjoy and have fun. Who come here with kindness will bring grace home. With a population of more than 52 million people, Myanmar is one of Southeast Asia's largest nations. There are 135 different ethnic groups living in Myanmar which makes it one of the world's most diverse countries, with a rich history and panoply of cultural and religious traditions. Nay Pyi Taw is now the capital of the Union Myanmar, as the citadel of Yangon is a commercial city and the city of the Golden Temple of Myanmar. Presently, there are two names for the country as Burma and Myanmar. However, the official name is Myanmar. Burma is taken after the name of the most populous ethnic group Burmese. Myanmar is a geographically diverse country, boasting fertile tropical deltas in the south and a rugged landscape in the Himalayan foothills of the north. The country is situated along the Bay of Bengal, and shares borders with Bangladesh, China, India, the Lao PDR and Thailand. Approximately 70% of Myanmar's people live in the countryside, and most rural families make their living from farming. While the country is rich in natural resources, the per capita gross national income has been estimated to be only US$ 220 a year. More than 80% of Myanmar population follows Theravada Buddhism. Monks can eat like civilians, but not killing and eating after 12 noon. Early in the morning, each group of clergy in yellow or brown coat walks through the streets for begging. In the afternoon, the nuns in pink coats also go in bustling group. The mysterious and striking plain of Bagan is a must to visit for all travelers during Myanmar vacations. Situated on the banks of the Irrawaddy River, this 42 square kilometre plain is the largest area of Buddhist temples, pagodas, stupas and ancient religious ruins in the world. These date from as early as the 11th and 12th centuries and are particularly atmospheric when viewed from above in a hot air balloon. 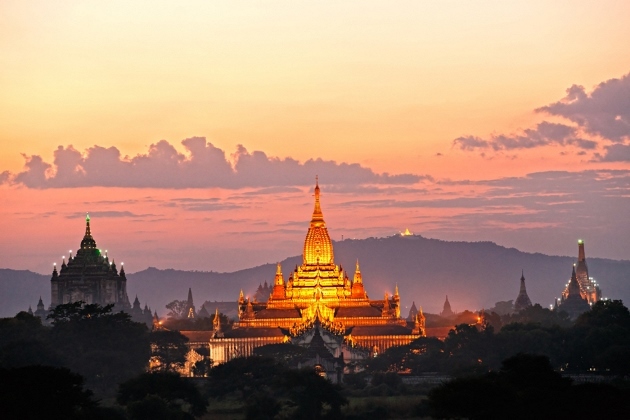 In Yangon, once known as Rangoon and the former capital, you can stroll along tree-shaded avenues and marvel at golden stupas and glittering pagodas. A walk around downtown Yangon reveals the spectacular Shwedagon Pagoda, and some of the most impressive colonial era architecture in the region. Mandalay offers the chance to offer alms and food to the monks and novices from the Mahagandayon Monastery before visiting the hundreds of peaceful stupas on Sagaing Hill.